BOISE, Idaho, April 4, 2012 (ENS) – It takes a lot to shock and sicken seasoned wildlife advocates, but the deliberate torture and shooting of a trapped wolf in northern Idaho by an employee of the U.S. Forest Service has. The incident in mid-March has triggered calls for both federal and state investigations leading to dismissal of the employee involved. The nonprofit Center for Biological Diversity Tuesday sent letters to both the Forest Service and the Idaho Attorney General requesting investigations into the actions of Forest Service employee Josh Bransford, who posted online photos of a wolf he had trapped that was then non-fatally shot by people who saw the animal from a nearby road. “A year ago, that wolf was protected as a member of an endangered species, but last month he was trapped, tortured and killed thanks to an underhanded congressional rider that’s also responsible for the deaths of hundreds of other wolves in the northern Rocky Mountains,” said the Center’s Michael Robinson. “A lack of respect for the balance of nature is leading to a war on wolves in the northern Rocky Mountains,” Robinson said. Stripping wolves of federal protection last spring transferred management of the animals to five states, including Idaho. Since the de-listing last May, Idaho has cut its wolf population by about 40 percent, from roughly 1,000 to 570, Idaho Fish and Game biologists estimated last month. The delisting was required by a rider on a budget resolution passed by Congress in April 2011 that funded the federal government for the remainder of the 2011 fiscal year. The rider was attached to the federal budget bill by Senator Jon Tester, a Montana Democrat, and Representative Mike Simpson, an Idaho Republican, and marked the first time an animal or plant has been removed from the endangered species list by Congress. Photo posted by “Pinching” of the trapped wolf in Idaho after it was shot by passing motorists. The treatment of this trapped wolf became public knowledge on March 19 when Bransford, using the name “Pinching,” posted his story and pictures on the hunters and trappers website www.Trapperman.com. 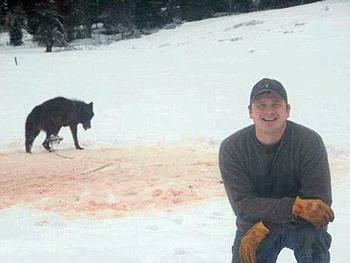 A posted photo shows the Forest Service employee smiling in front of the still-living wolf. The posting appears to have been removed from the Trapperman.com site. Idaho state law makes it a crime for a person who “causes or procures any animal to be cruelly treated, or who, having the charge or custody of any animal either as owner or otherwise, subjects any animal to cruelty.” The law also requires that “destruction of animals for population control,” the stated reason for wolf trapping, be carried out humanely. “Making it possible for potshots to be taken at a captive animal – and photographing the results – before ending the wolf’s suffering appears to violate this law, as well as common decency,” said Robinson. “We are sickened by the wholesale slaughter of an animal, the gray wolf, that, but for last year’s wolf delisting rider, would still qualify for protection under the Endangered Species Act in Idaho and elsewhere in the northern Rocky Mountains,” the letter states. Removal of Endangered Species Act protection for the wolf was based on the assurances of state game agencies that they would manage wolves to ensure survival of the species and approval of state wolf management plans by the U.S. Fish and Wildlife Service. Idaho has since abandoned the targets of its state plan and instead said it will seek to reduce the population from roughly 1,000 wolves to as low as 150 wolves. Since the delisting, 375 wolves have been reported killed in Idaho. Idaho’s wolf hunt remains open in portions of the state.